Welcome! I'd love to chat with you about my books. Click on the button below to get in touch. Simon Mendez has an anger problem, and he’s about to unleash his fury on the Spanish Inquisition. The Mendez family is on top of the world. An upper-class family in 17th century Spain, they live a secret life – outwardly Catholic by all accounts, but desperately worried that, some day, someone will discover the Jewish traditions that they practice behind closed doors. Everything comes crashing down when the Inquisition arrests Simon's father. Incensed, Simon must retaliate with everything he’s got. With his father set to be burned at the stake and a sadistic hometown eager to see it happen, Simon has no time to lose. It will take his sharp wit, brutal weapons and raw courage to strike back hard at the Inquisition - before it’s too late. Join Simon Mendez in a battle that you will not want to miss! Yaakov Peretz is out to catch a pirate. Buried treasure, old-school pirates, and an international race against time will make this summer vacation the thrill of a lifetime. When the Peretz kids discover a mysterious map inside their family’s robot, there’s no telling where it may lead. Digging up a box of priceless gems in the Mojave Desert is a fun way to spend a hot afternoon, but returning a billionaire’s stolen loot is no simple feat. Yaakov Peretz and the others will have to get past Pete Weasel and his pirate gang. And even if they do, they’ll soon learn that foiling a bunch of thieving pirates is just the beginning. Yaakov will have to put together the clues, and gather all of the wit and grit that he can muster, to stop a dangerous crook before it’s too late. Summer is almost over, but the heat is suddenly rising for Yaakov Peretz and his family. A neighborhood bully and another shady character are planning something sneaky at a Southern California airshow. Yaakov knows. He overhead them plotting. And it’s time to take matters into his own hands. But soon his hands are really tied! Before they know it, the Peretzes find themselves hostage to a mysterious stranger known only as “Raul,” a man with something more devious up his sleeve. Escaping capture is only the beginning. 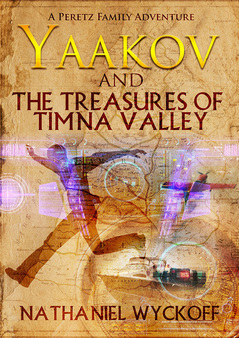 Yaakov and family soon uncover Raul’s conspiracy to wreak disaster in Israel’s Timna Valley Park, the site of King Solomon’s ancient copper mines. The stakes are high! Yaakov will take nothing lying down. In a daring race against time, he’ll plunge into unfamiliar territory, battling live and robotic foes and more to defeat this evil scheme. The Peretz kids are on a quest for Temple gold. After battling pirates, kidnappers and other scoundrels this past summer, all that the Peretz family wants is a quiet Chanukah vacation in Israel. It's an enjoyable getaway until the last day, when things start to get strange. Rutvij Rao runs the Acra in Jerusalem, a fortress built centuries ago by a Greek tyrant named Antiochus. Antiochus was defeated in the story of Chanukah, and the remains of his destroyed fortress are now a museum for tourists. But Rutvij, Antiochus's descendant, has his own plans for the old ruin. Resolved to avenge his great ancestor's humiliating defeat by the Maccabees, the egomaniac Rutvij is turning the Acra into the capitol of his own new dictatorship. He has trapped all of the museum's visitors, "inviting" them to be founding citizens; nobody leaves until the world acknowledges Rutvij Rao's kingdom. Unfortunately for him, his captives include the Peretzes. Yaakov Peretz and his siblings are determined to escape from the Acra and to stop Rutvij Rao in his tracks. The kids have discovered the fortress's well-guarded secret: a mysterious map of a maze carved into a little-known passage running underneath the ancient citadel. Join them on their latest daring adventure, which will take them on supersonic trains, to the frozen peaks of the Himalayas, and through perilous underground tunnels, as they race to uncover a Temple fortune and to free the mad dictator's hostages...especially their parents! Available at Amazon.com. ​Jamaica is a land of discovery and adventure, and Yaakov Peretz is about to encounter both. The Peretz kids have long known the story of Christopher Columbus’s legendary gold mine on Jamaica. It’s a tale that’s been in their family for generations, since an ancestor named Simon Mendez lived on the island to keep the Spanish Inquisition off his back. They’ve also heard stories of the pirates who once inhabited Jamaica and turned looting Spanish ships into a national sport. So, when their mother’s former teacher invites everyone to Jamaica for an art show, the trip seems like the opportunity of a lifetime. Better still, Yaakov, Yosef and Rachel find an old letter from Simon, a letter that will show them the way to the mine…if they can figure out what it means. Armed with their family stories and their digging robot, the kids leave a boring art show to strike their fortune, but danger can’t stop following them. Their quest for priceless treasure quickly takes a wrong turn when a missile from nowhere knocks their tour guide’s helicopter out of the sky. Kidnapping, chases and run-ins with villains are soon to follow, turning a hopeful treasure hunt into a struggle for survival. And that innocent art teacher may not be what she seemed. There are dangerous people on Jamaica, people with secrets to protect and the wicked means to do so. Yaakov is determined to bring them all down and to solve the mystery of Columbus’s gold mine once and for all. Why not? He’s a Peretz. The bad guys have messed with the wrong tourists.